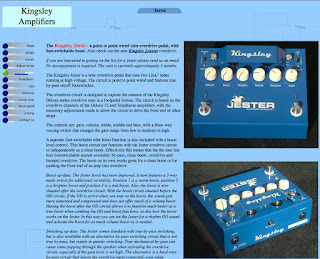 Just placed an order for a Kinglsey Jester Boost/OD pedal with Simon Jarrett of Kingsley amplifiers. This is an all handwired clean boost and OD pedal that runs with two 12ax7 tubes and is built with a sturdy looking metal enclosure. "The overdrive circuit is designed to capture the essence of the Kingsley Deluxe series overdrive tone in a footpedal format. The circuit is based on the overdrive channels of the Deluxe 32 and ToneBaron amplifiers, with the necessary adjustments made to allow the circuit to drive the front end of other amps. The controls are: gain, volume, treble, middle and bass, with a three-way voicing switch that changes the gain range from low to medium to high. A seperate foot-switchable tube boost function is also included with a boost level control. This boost circuit can function with the Jester ovedrive circuit or independently as a clean boost. Effectively this means that the the user has four footswitchable sounds available: by-pass, clean boost, overdrive and boosted overdrive. The boost on its own works great for a clean boost or for pushing the front end of an amp into overdrive." Should be an awesome pedal! !